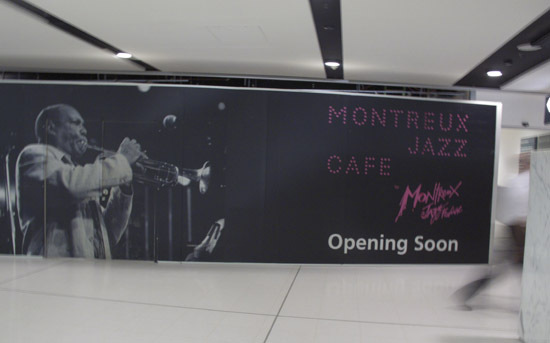 Fresh on the heels of the Bambini Wine Room and Danks Street Depot adding surprising quality drink and food experiences (respectively) to Sydney International Airport, there’s now another high-profile establishment ready to join the fold – the Montreux Jazz Cafe. It’s the first expansion of the concept outside of Geneva, which, from what I can gather from the website, pairs a meandering menu of French-meets-American-meets-global cuisine while airing exclusive jazz footage from the famed Montreux Jazz Festival. Think beef tartare to cheeseburgers, salmon a la plancha, tapas of Indiana chicken wings and Ella’s cheesecake (I’m assuming Fizgerald). Apparently they’re simplifying the menu for Australian tastes, which, after a brief moment of feeling insulted, on second thought is probably a good thing. In fact, I’m hoping they forget all about the global cuisine and just put out a lovely little menu of French-inspired Swiss dishes. I’d be happy to enjoy some raclette while waiting for Icelandic volcanic ash to settle down. The launch party is next week, so I’ll keep you posted. Sydney, I gotta say, is a curious place for the second opening of the famed jazz cafe. Our fair city is not exactly a jazz hotspot – a distant second behind Melbourne and lightyears behind New York – even if there have been a couple of positive moves lately, especially the new, above-ground home of jazz club 505. But maybe that’s the point; to bring a jazz experience to a city that’s desperately in need of it, so kudos to any cool cats bringing more seventh, ninth and eleventh chords to this note-deprived metropolis.